Transform your grill into a fantastic smoker - You can add this tube to your home grill. Build your own smoker using Kaduf's smoker tube and your regular grill only. Simple to use and easy to clean. - You can start smoking your favorite dishes in just 10 minutes. Made from Top Quality Stainless Steel Material 100%. The Kaduf pellet smoker tube is built to last, it is very strong and can be used for a very long time from the first use. One tube smoker filled with your favorite pellet can provide smoke for 4H. It's ideal to smoke like a PRO - The only product that comes with a book of tips and tricks about how to light pellets. 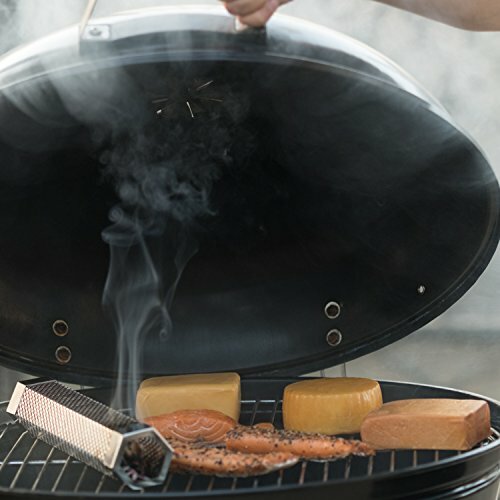 The tube smoker works perfectly of all kinds Grills - charcoal, gas, electric, portable and pellet, or any type of Smokers: gas, electric, charcoal and pellet smoker.It works with any kind of pellets,wood or chips. If you have any questions about this product by Kaduf, contact us by completing and submitting the form below. If you are looking for a specif part number, please include it with your message.